Riding whip with light braided thong. 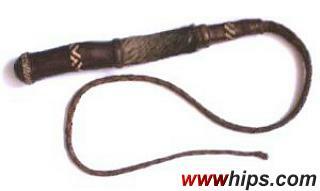 The handle is a natural-shaped stick with thin leather shrunk around it. The leather is stitched with straw-like material, while the midpiece of the handle is covered with some fur, maybe from a goat. Unfortunately, some vermin or moths affected the decoration, shaving off most of the hair.